Swindon Town's running costs have been cut by two-thirds since the club changed ownership earlier this year. It was revealed in January that the League One club were up for sale and a month later Jed McCrory's consortium took over at the County Ground. An audit was commissioned and results show operating losses have fallen from £3.6m per annum to £1.2m. Owner Lee Power, who took over the club from McCrory last week, will continue to underwrite the shortfall. February: Manager Paolo Di Canio leaves. Three days later, Swindon takeover completed by the Jed McCrory-led Seebeck 87 Ltd consortium. April: Lee Power joins the board at Swindon and becomes part-owner of the League One club. May: New manager Kevin MacDonald leads Swindon to the play-off semi-finals where they lose to Brentford. July: MacDonald quits and Mark Cooper is put in temporary charge. He is made permanent a month later. November: Swindon Town general manager Steve Murrall resigns from the board of directors. He becomes the third member of the Seebeck 87 consortium to leave. December: Swinton 20 Reds, set up by Lee Power, is confirmed as new Swindon Town owner. 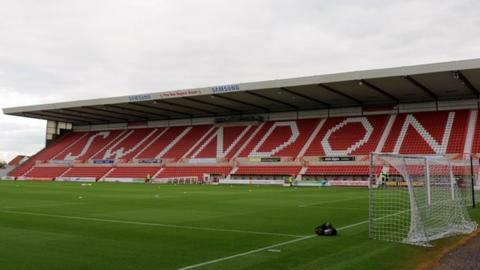 Financial problems at Swindon came to light at the start of the year, when then-owner Andrew Black put the club up for sale because he was no longer willing to invest. At the time, Black considered putting the club into administration in order to wipe out £9m of unsecured debt. McCrory's Seeback 87 consortium took over in February, while Swindon were under a transfer embargo for overspending on wages and fees. The new board then slashed the playing budget from £4m to around £2m as part of their financial restructuring. Director Sangita Shah has now confirmed that debts at the club have reduced from £13.1m to £2.95m, with the latter figure a long-term debt owed to Black and former board member Sir Martyn Arbib. In a statement, Shah said: "In a nutshell, the club is in a far healthier financial position than it has been for a number of years. "The board is committed to protecting the long-term future of the club, and putting its finances on a sustainable footing. "And to that end, by the end of the season, irrespective of whether we are promoted or not, we will be taking measures to ensure that the net running costs of the club are covered by its income."